Totally inspired by blue/green color palettes--especially in a kitchen! I love that "sea froth" colour! everything about this is perfect. love it! I love those tiles in the first picture! that backsplash in the first image is amazing. A blue kitchen would be so amazing, this one especially is so beautiful. Love this so much, I fee like if I had this kitchen I would cook so much more!! Those are my colors! I can't help but love both of these rooms! mint green!! !how refreshing! love that chandelier! I adore the mint green! Looks awesome! So fresh and comfy! I can't see the picture! Clicked the link, though. Way too intimidated to clean my own pantry. i adore those sinks with the wrap over the counter metal, it is so farmhouse cozy! The pinstripe rug is great! That first kitchen was designed and belong's to my friend Kiira's mother! It's even more amazing in person, and I'm so excited to see it featured on your blog. Looks so peaceful and fresh! 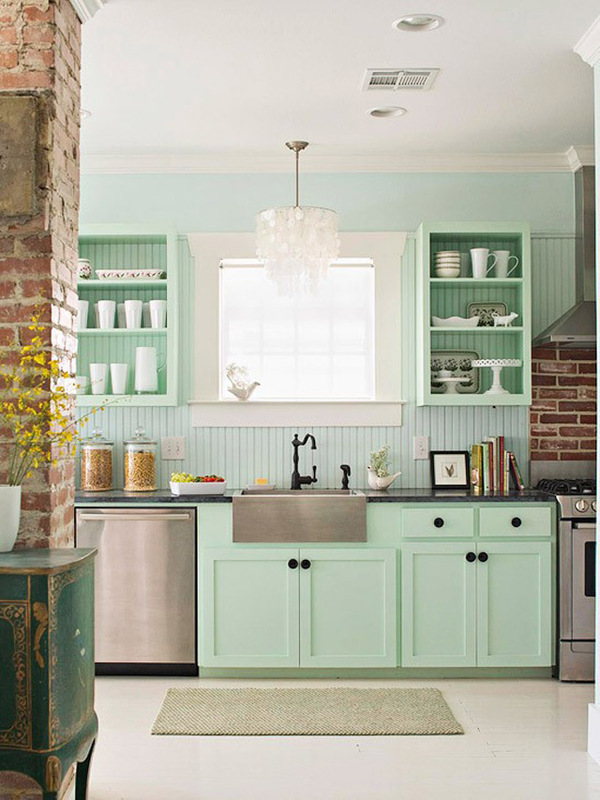 Loved the mint green cupboards! Omg that first kitchen is amazing. I usually wouldn't think of a seafoam color, but it looks great as a backdrop color. love love both of those kitchens! I love tile back splashes behind the stove area! 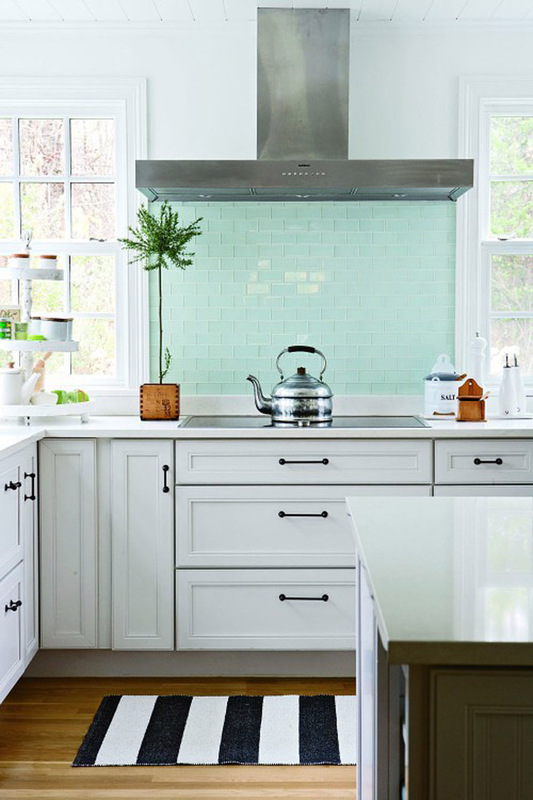 I love the seafoam green of that kitchen. The tiles just make it look inviting. Having hints of color will give your home a taste of your personal style. Great post! Love the mint! So refreshing and it makes me want to redo my kitchen. Taylor, it is adorable! thank you for posting this beauty! I love this! I am in the middle of planning my "key west" kitchen re-model and have been looking for the perfect seafoam color for the backsplash. I'm going to be adding these pics to my pinterest! Oooh, I absolutely love! Beautiful colors! I love stylish houses! These are great, clean colors for a kitchen. The sea foam looks very nice. totally gorgeous! love the color! I love the first backsplash! This kitchen inspires me as well! That's really one of my favorite parts about real estate, I see so many fabulous houses in San Francisco and I feel continuously inspired by the way they are arranged and designed!